The latest incarnation of the famous King Arthur tale gives a unique and ambitious story in King Arthur: The Legend of the Sword. The film takes off immediately showing a fierce and destructive battle between Uther Pendragon (played by Eric Banner) and his bloodthirsty, power hungry brother King Vortigen (played by Jude Law) leaving a young orphan Arthur (played by Charlie Hunnam) without any knowledge of his identity. Even though I’m not a fan of a medieval knight’s tale (especially one told so many times) I particularly enjoyed this one. The plot focuses more on King Arthur’s background story of him growing up without any real sense of who he really is makes this version of the character more noble, relatable and enjoyable. 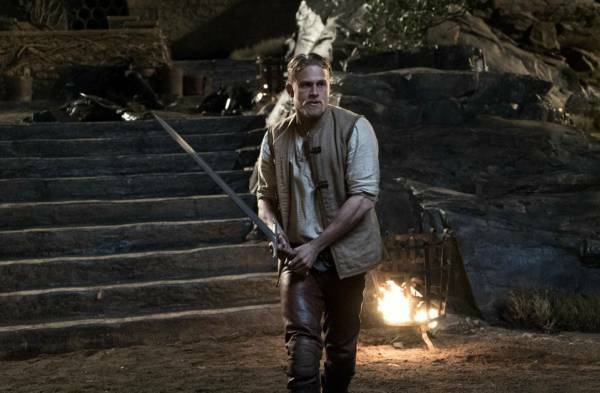 It also helps the fact that Charlie Hunnam’s King Arthur is funny, dashing and chartable which makes the audience invest more emotions to the character. I am safe to say this is one of Hunnam’s best performances. Other than Hunnam, Jude Law’s version of the evil king Vortigen was absolutely stunning, as we witnessed him sacrificing and killing his own wife and daughter to sit on the thrown he so badly desires. This almost wanted me to hate him but at the same time feel for his character due to him being lonely and regretful. It was no easy task for Guy Ritchie to execute such intense and heart pounding battle scenes especially when we’ve witnessed countless King Arthur battles and fight scenes. The use of slow motion and CGI sword battles showed us the true power and significance of King Arthur’s famous trademark sword “The Excalibur” which we have never seen like before. This also establishes a special relationship between King Arthur and his sword much like Thor and his mighty hammer “Mjolnir” as the King needs to believe in himself to wield the power of the sword, which creates an emotional obstacle as well as a physical obstacle he faces. The slow motion sword fight transitions into a fast paced battle and adding the brilliant soundtrack creates a fierce, breathless and sensational atmosphere which puts you right in the heart of the action. Although this film has its moments it also has moments where you want to close your eyes and wait for the sequence to move on. For Instance the dialogue at times would feel to cheesy and over the top when really we want to see the main body of the issue being addressed rather than sloppy banter and a few bland jokes. This slowed down the tempo and pace of the movie just when it was about to take off creating a weird balance of emotion and atmosphere. To sum it all up, I would highly recommend this film to a viewer despite the box office bomb and harsh critics reviews. The movie captures a stimulating energetic frenzy which very films try to capture. I can put this movie as one of the best movies in 2017. Some critics make this move look so bad, but I don’t care this movie its wonderful. Such a GREAT movie, HUGE production quality, writing and acting and MUSIC! !… Yet, critics panned it, so it failed. Can we just admire Jude Law’s ability to completely revel and ham his role up to the umpteenth degree without chewing the scenery around him?